Posted 9/14/2013 9:52am by Josie Hart. The potluk has been rescheduled to Sunday, October 6, from 1 - 4 p.m. We hope you all can make it and for those in Downtown Denver, this date should provide much less traffic! We will be in the large Prairie Canopy tent on the far side of the Chatfield Visitor Center. Please park in the upper CSA parking lot and join us at 1 p.m.
Our fall crops are defintely in! With giant cabbages and broccolis, the cooler weather has given these crops quite a perk. We will have potatoes next week and continue to offer the warmer weather crops such as tomatoes, peppers, basil and eggplant. We have already begun the harvest process for our winter squash and it's looking like it will be a promising crop this year. The wild plant class takes place this Saturday at 9 a.m. at Chatfield. It is called "Wild Things Walk: Identification and Uses of Wild Plants for Food and Medicine". 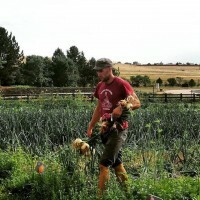 link for registration details on all Chatfield CSA classes. featured recipe: BLT salad- we try to feature veggie recipes through our newsletter but this salad is so yummy we had to sneak a little bacon into the mix! Hopefully you can use up any extra tomatoes from last week! *sea salt and coarse pepper a must on the top of this salad! Cook the bacon to a crisp. Drain the excess fat and let the bacon rest on paper towels. While the bacon is cooking, wash the lettuce and tomatoes. Pat dry. Separate lettuce, slice tomatoes and crumble bleu cheese. Arrange on plate. Add warm, crumbled bacon to salad. Serve immediately. You can add a buttermilk ranch or garlic mayo dressing to this salad as well, however if you use bleu cheese crumbles you wil havel a rich flavor already. Add homemade crutons. We hope you all have a great week and please send us your recipes!